How about Brunch this week, for the weekend or for dinner? This is so simple, so easy (much easier than making regular old French toast in a skillet or a griddle!) and an elegant treat. Your family will think you’ve really went overboard when all you’ve done is throw some pantry ingredients and day old bread in a skillet. Shhhh…I won’t tell if you don’t! This is Tyler Florence’s Ultimate Upside Down French Toast. It’s pretty amazing. You’ll want to pull out your cast iron for this one, or at the very least a good heavy bottomed oven proof skillet. On the stove-top you’ll melt butter and sugar until it’s caramelized, then add a shot of cream. Quickly layer in your apples, sprinkle in the cranberries – and then add your bread slices that have been soaked in egg and milk. How about it? Does that remind you of a Tarte Tatin? Of which I don’t have on my blog yet. Why not, I don’t know. But this is as close to dessert for breakfast that I get. Well, maybe there’s a few coffee cakes and quick breads, too…now that I’m thinking about it! This same technique could be used for other seasonal fruit. How about pear and almond for one! Tyler used half apples and Challah. I just sliced the apples and placed them around in concentric rings and used what I had on hand, a half a loaf of Italian bread. And the servings? Don’t count on eight – not unless you have a few sides to go with it. And not if my parents are eating with you, lol! They inhaled this, stopping only to give compliments and make little happy noises. Preheat oven to 350 degrees. In a flat dish (a 9×11″ works well), crack eggs and add milk, vanilla extract and cinnamon. Whisk until well combined then lay bread slices in mixture to coat and absorb it all, turning occasionally. Set a 12-inch skillet, seasoned cast iron if you have, over medium heat. Add the butter and 1 cup sugar and cook, stirring constantly, until the sugar has melted and caramelized, about 5 minutes, then add the 1/2 cup cream, stirring and bring to a boil. Turn off heat and begin adding the rest of your ingredients. While the sugar is melting, peel apples, then use an apple corer to make your slices. Gently press in the apple, fanning them in concentric circles. Sprinkle with cranberries. Lay soaked slices of bread over the top so it is completely covered – you should be able to arrange the large slices and small slices so there are no gaps. Sprinkle the top with some brown sugar and place into the preheated oven. Bake in the middle of the oven for 40 to 45 minutes until the top is golden and puffy. When done, allow to cool for two to three minutes, run a knife around the edges of the pan, then invert on a large plate. FYI – if your cast iron skillet is not seasoned, the cranberries will react with the skillet and turn black. Note: Make sure you have a platter large enough to invert the 12 inch skillet on to, and be careful – hot skillet, hot caramel can be a dangerous combination. Make sure you have a clear workspace to set it down on. I’ve use a large rimmed cookie plate and a large charger, before. 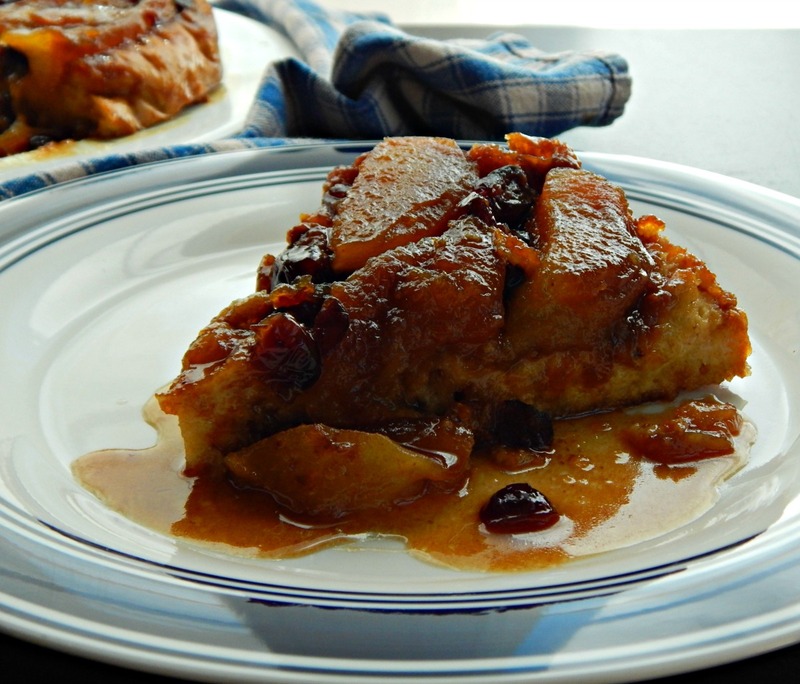 If the apples are juicy, hot caramel may squirt out as you invert. Depending on the apples and how juicy they are, there can be variances in how thick the caramel is – While this is always impressive, don’t expect absolute perfection every time. Read Strategies for additional tips as well as throughout the recipe, for saving time and managing food. Per Serving: 311 Calories; 12g Fat (34.9% calories from fat); 8g Protein; 43g Carbohydrate; 3g Dietary Fiber; 149mg Cholesterol; 211mg Sodium. Exchanges: 1 Grain(Starch); 1/2 Lean Meat; 1/2 Fruit; 0 Non-Fat Milk; 2 Fat; 1 Other Carbohydrates. Make this with any nut you prefer, or vary the fruit. How about Pears? Perfect for winter. Leave the cranberries out, or substitute some dried fruit of your choice. One of my favorite variations is to use a little Kahlua in the eggs, crushed hazlenuts and no fruit. Amazing. I’ve made this with pumpkin pie spice, leftover from my Pumpkin Spiced Lattes we loved so much this fall, and it was wonderful. A fun change from regular, old dinner, and this brunch dish is great: it’s quick to get in the oven, then there’s 40 to 45 minutes of down-time. This entry was posted in Click here for Bargain Meals, Click here for Fabulous Food Posts and tagged Apple, Bargain Meal of the Week, Breakfast or Brunch Dish, Dried Fruit, Eggs, Frugal Hausfrau, leftover bread, Leftovers, milk, Nuts and Seeds, Tyler Florence. Bookmark the permalink. Thanks for sharing this recipe. I get Challah bread often and this is just perfect recipe. I have booked marked it. I did visit your site and even translated it so I could read it. We’re all entitled to our own opinions, it’s when we decide others are entitled to our own opinions that we run into trouble…hope you find what you CAN enjoy somewhere. For me, staying on budget is a serious business, not always fun and enjoyable, and sometimes nitpicky and skinflinting. The French Toast – that I enjoyed!